The die cutting machine is mainly suitable for cutting various of nonmetal materials. 1.Adopting PLC control the conveying part to save a lot of time and improve efficiency. 2.These materials are clamped by the cylinder and are driven by the servo motor into the cutting area of the die cutting machine. 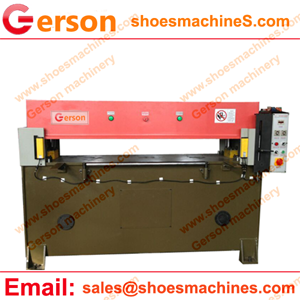 3.The hydraulic cutting machine is installed with safety protection at the inlet and outlet of cutting area,which can guarantee personal safety of operators. 4.Replacing of die cutter is very convenient and prompt. 5.Because the die cutting machine equips the cutting board micro-movement device,evenly consume the cutting board,save cost,reduce consumption.